From its inception, Disney has created colorful letterhead stationery celebrating its films. This Walt Disney Archives Collection Letterhead Stationery Volume 2 set includes 5 sheets each of Sleeping Beauty, Pinocchio, 101 Dalmatians, The Rescuers, The Cat from Outer Space, Who Framed Roger Rabbit, Winnie the Pooh, and Hercules. 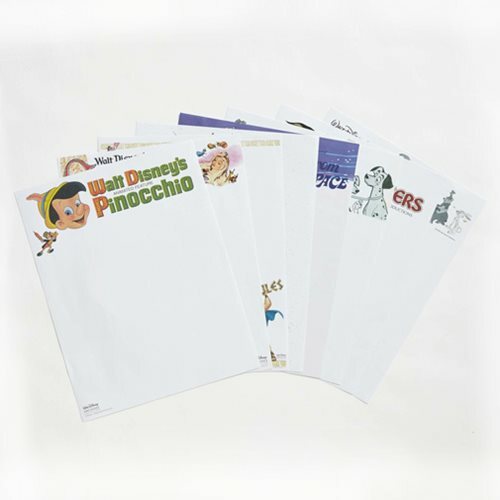 The 40 sheets of colorful letterhead stationery honoring these classic Disney films measure 11-inches tall x 8 1/2-inches wide.